A window display, like the ones seen here, is the difference between a successful institution and one that is out of business. Since the early 1800s, shop owners have been dressing up their storefronts with visual merchandising in hopes of bringing in more profits. What are window displays? This term refers to any storefront that advertises goods or services via signage, mannequins, videos, or any other beautiful medium. The window displays incorporate many of the aforementioned tools to garner greater interest. Creativity is encouraged when employing store design tools within this traditional form. Imaginative window displays are sure to bring in more customers. People are drawn to the excitement. These window displays, comparable to retail showcases, take the same models and methods that profitable shop front dressers have been applying on the streets of London for hundreds of years, and update them for contemporary tastes. How are these visual merchandising solutions different from conventional storefront visual merchandising? All of the lighted boards, poster kits, mannequins, and other merchandise are fashionable and functional. These window display systems combine durability and charm. However, this is not to say that all of the merchandise in this category are expensive. 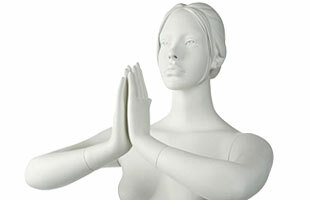 This window display system catalog includes many economic and deluxe options for every budget. Advertisements, not unlike these, work well in New York City clothing shops, as well as small "mom and pop" stores. These window displays project the theme or essence of a collection or establishment to the public. Who uses visual merchandising fixtures? Clothing shops and boutiques often outfit their shops with their wares. These storefronts setups that include mannequins wearing their latest collection or old favorites. This retail showcase helps customers visualize their wares. Real estate agencies will arrange images of their properties in the shop with a window display to attract passersby into the office. It is a typical practice for these associations to include numerous picture holders on a variety of different cable systems. Hanging cables, poster hangers, and other window display ideas help advertise their real estate. Restaurants and bars organize different signage in the storefront to advertise. This window display offers everything from a reminder that the establishment is open to sharing the entirety of the menu. Depending on the type of eatery, signs are capable of marketing most anything from appearances by entertainers to theme nights. Many associations will have a holiday motif in the appropriate seasons. Halloween and Christmas themes are some of the most popular. This practice demonstrates some light-hearted fun and may increase sales. 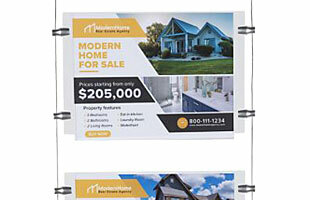 Another great option for placing signage and posters in the storefront area is using poster rails. 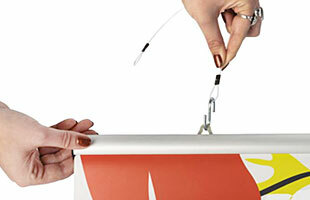 These store design tools are convenient hanging kits. 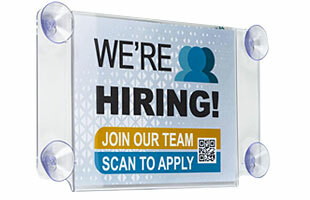 Developed for signs and posters alike, these packages come with snap action rails that attach to the window. 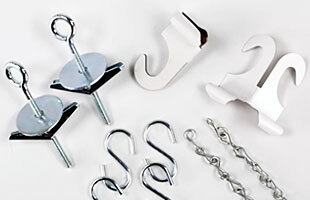 Plastic, plastic with aluminum accent, or aluminum clamps are aesthetically pleasing and dependable retail showcases. 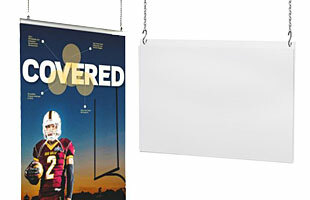 These visual showcases accommodate posters ranging in width from 18" to 72" wide. This accounts for banners that may fill the entirety of some windows. Every rail features two eyelets designed to accept standard-size "S" hooks or other affixing hardware. For those unable to attach marketing solutions to the ceiling, plastic suction cup store design tools are a good substitute. These retail showcases include two vacuum mounts that attach to any window. With deluxe, economy, and mid-range styles presently in stock, there is certainly a banner rail that will fit any budget. Illuminated acrylic holders are also available with cable kits. Users call even more attention to their elegant posters with the bright LED lighting built into the clear or black panel. The lighting system spreads evenly over the advertisement without any hot and cold spots. 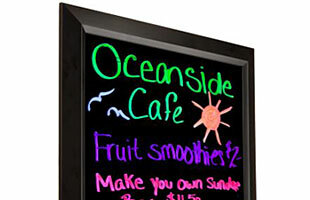 Advertisers plug this unit into the wall outlet, and it will illuminate your advertisements as well as the storefront. Users insert images and messages into the holder with the peel off gel lenses. Made specifically for the signage, users simply peel off the front lens and align their images to the precise place necessary. When in position, just reattach the gel lens to the panel. The adhesive does not lose its tackiness after various uses. 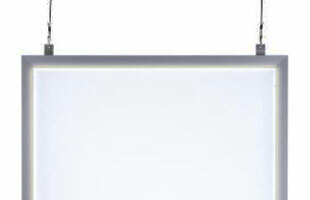 For people looking for larger poster holders, window hanging light boxes are also available. Many establishments need a small lighted message in their institution. Many restaurants and super markets just want visual merchandising that lets customers and passersby know that their shop is open. 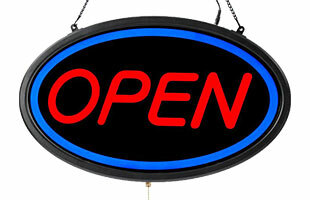 Bright red "Open" signs with different designs and accents are available for purchase for these types of associations. Shops attract people off the street with the circles, lines, and waves around the text. In addition to the basic "Open" sign, there are other store design tools offered as well, designed specifically for drive-through restaurants, delivery restaurants, beauty salons and tattoo parlors. Any institution with an ATM or WI-FI should take advantage of other visual merchandising choices offered here. Hotels and motels may want LED message systems that alternate between "Vacancy" and "No Vacancy." All of the different retail showcases come with a kit for suspending the messages to the ceiling. The merchandising messages offer three different animation settings for best attracting target audiences. With a 12 volt adapter, the unit easily plugs into any electrical outlet. These message boards bring passersby in all night long.